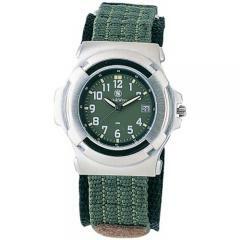 This rugged watch from Smith & Wesson comes with a high-strength nylon strap for a secure, adjustable fit. Its durable body is water-resistant to 30 meters, perfect for all-weather use, and it features a scratch-resistant mineral glass face for protection. Its white numbers stand out clearly against the olive face for easy reading, and the minute and hour hands are luminous to make the watch readable even after dark. It contains a precise Japanese quartz movement for accurate timekeeping, powered by a long-lasting lithium battery. It comes with its own watch stand for storage between wears.